Is it a manager's job to motivate team members? Or is it our job to just get out of the way? 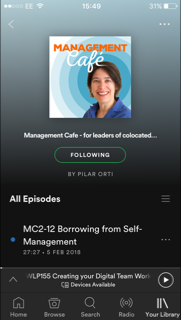 In today's episode, Pilar shares a couple of motivation theories and asks some questions to help you determine whether your behaviour is nurturing self-motivation or hindering it. Self-determination theory suggests that we are inherently driven to be the best we can be and our motivation is affected by our surroundings and context. In order for this intrinsic motivation to flourish, we need autonomy, competence and a sense of relatedness to either others or a common purpose. Pilar recommends Smarter, Faster, Better by Charles Duhigg, which has a brilliant chapter on Motivation. Locus of control affects our motivation and it can be affected by training and feedback. When working as a virtual team or in a remote set-up, we need to keep an eye out to feed that sense of relatedness. The Progress Principle and the "inner work life". Emotions and perceptions during the work day. Catalysts - actions that directly affect the work and helps people to want to do a good job. Nourishers - actions that show support and help us feel happy about doing the work. Inhibitors - prevent us from feeling happy at work. Toxins - actions that decrease the happiness of workers. Remember, before you even think about what you can do to "motivate others", assess whether there is anything you're doing that might be inhibiting their intrinsic motivation. What Makes Us Feel Good About Our Work? Great TedTalk by Dan Ariely which re-defines "meaningful work".